Note the fine dull ballast on the siding and yard in the forground. This is very much a feature of railways from the steam era. Click photo to enlarge. We’re not taking about the turn midnight, frogs and glass slippers here, but the days when steam reigned supreme! Before central heating but when we toasted crumpets in front of an open coal fire, coal was the backbone fuel of Britain as well as the major mineral handled by the railways. As a result of its extensive usage for powering and manufacturing things, the bi-product was ash and cinders – literally millions of tons of the stuff. Rather than waste it, one of the uses of this dusty plentiful product was to ballast sidings and little used railway lines. In some northern areas it was even used for ballasting mainlines where they had an even more plentiful supply due to the extensive coal fired industry. 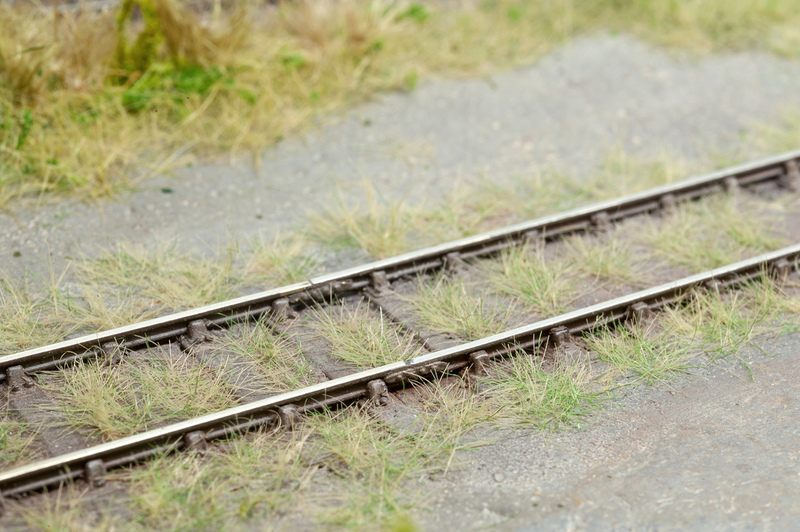 Many steam era railway modellers ignore following the real world and tend to ballast their sidings with granite chippings as seen on main running lines. 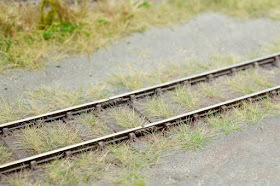 Some even include a ballast shoulder in railway yards which looks and is totally wrong. Frequently this error can be observed on layouts that utilise the finest scale and most accurately gauged track. I have a hunch this is due to people copying other model railways rather than observing pictures of the real thing, my other thought is that modellers simply do not know how to generate the effect? 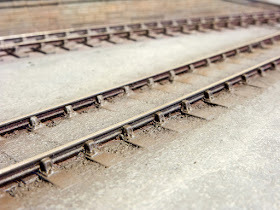 The use of granite in sidings is only a feature modern times and as a rough rule of thumb should only used to create the appearance of track that has been laid or re-ballasted after the end of steam. At first the above appears simple to replicate, simply use some fine dust like granular substance which isn’t illegal and spread it onto the track and dribble diluted PVA over. Those who have tried this will know that all that happens is that we end up with a mess as the glue forms dusty balls that refuse to sink in however much or expensive the washing up liquid is used to help break the surface tension. Another technique which is likely also to remove any outstanding cranial hair is the use of plaster. Plaster can be used for big wide flat areas, but as soon as it goes anywhere near rails, sleepers and chairs, it will cling like molten ice cream does to a clean shirt better than barnacles do to a sunken wreck off the Needles. Do not despair; Humbrol Air Clay or Das Modelling Clay are our savours, with their plasticine like qualities being ideal for packing down between sleepers to create that distinctive smooth effect which is so removed from that of granite. Humbrol Air Clay and DAS are available from many model or craft shops, and is supplied in brick sized in air tight packs. Once opened it will dry out and spoil, so it’s a good idea to reseal it in some kitchen film after use. 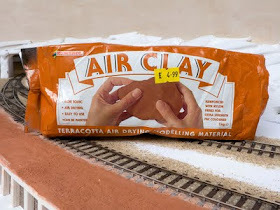 The most common colours are white and terracotta, neither of which is right unless one is using it for ballast the railway in a china clay works in which case choose white. We address the colour later so do not worry at this stage. Firstly paint your sleepers and rail sides then ballast to just under sleeper height using your usual favoured paint and ballast; I favour sieved sand because it’s nice and fine. Then drench in the time honoured way using diluted PVA white glue and allow it to properly set. 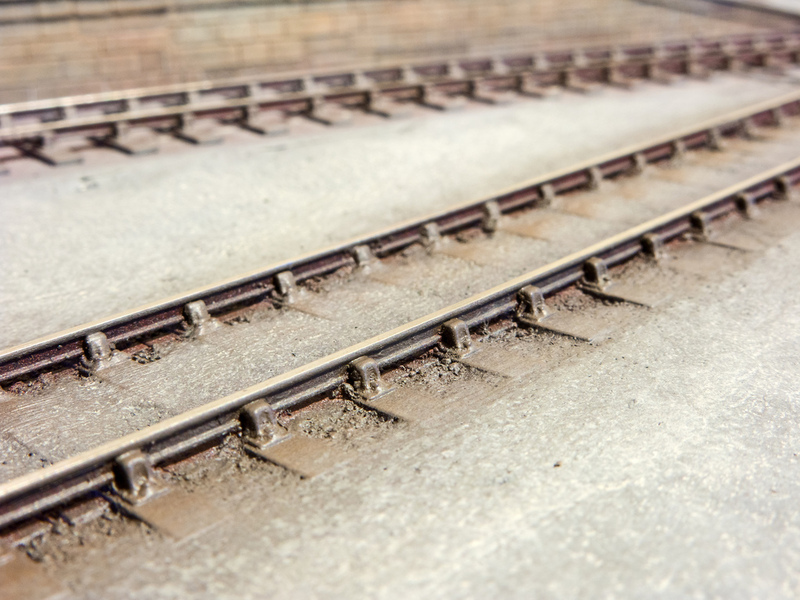 If you use track with thin sleepers like SMP or C&L you can omit pre-ballasting. Next comes the fun bit (OK, just a little better than swimming in the freezing sea in January); scoop or break off a tea spoon sized lump of clay and using fingers and thumbs press down and spread it over the existing ballast and between the sleepers and tracks working on 2 or 3 inches a time. Once it’s fairly even, with a stiff brush (a 1 inch decorators’ one will do or one of those cheap kiddies’ brushes) pack it into place between the sleepers much like a dentist does when packing a new filling, taking care to avoid getting clay onto the sides of the rail and chairs. Repeat until your whole area is covered, I suggest doing this is dribs and drabs to get a break and to appraise the progress. 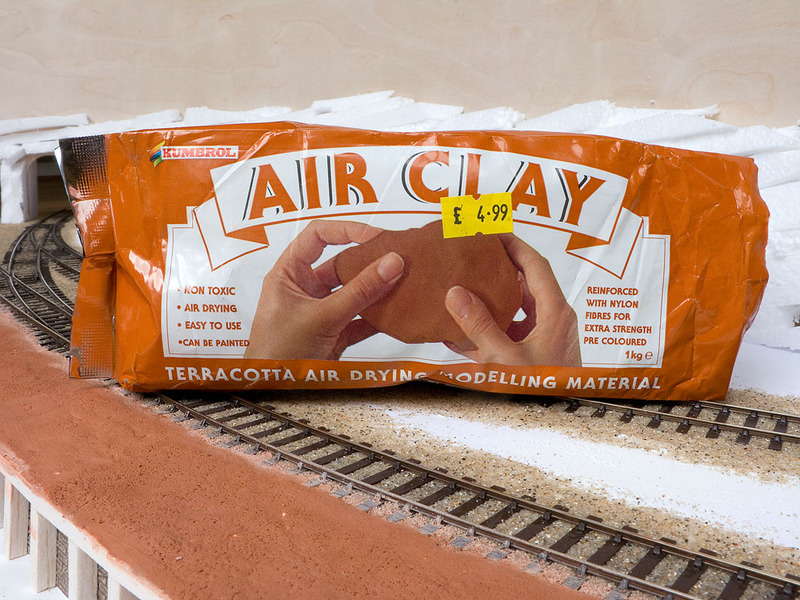 When working on wider areas like between tracks or in a yard, it is a good idea to paste on a thin layer of PVA to help the clay adhere to the surface. As the clay dries it may lift or crack a little, if so push it back into place with a thumbnail or back of a spoon. Once fully set, any outstanding cracks (more of a feature with Humbrol Airclay than DAS) can be dealt with smearing in some fresh clay or wetting the surface and smudging over with a thumb.Once you’re satisfied with the result you’ll want to colour what you’ve done. For this you can use your favoured medium of matt enamel, matt acrylic, or my favourite – matt interior emulsion. 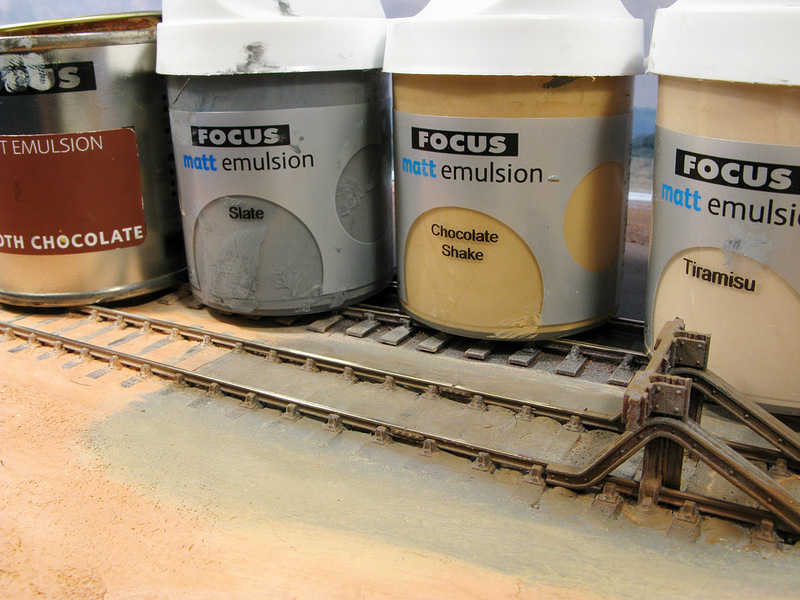 I like matt emulsion because it’s easy to get hold of from D-I-Y superstores with the loss of so many model shops. No need to buy big tins, use the little match pots, there are all sorts of dull earthy colours that are far more suited to our uses than painting walls. I guess this is one positive bi-product of all these faddy TV programmes where they transform bright cheery rooms into dull and often gaudy caverns. Adding a little static grass is a good touch. What colours you choose is up to you; I prefer to use paler grey and beige tones, using the darker shades around the track, blending to lighten the open areas. good touch once you’re happy with the colouring of the clay and sleepers is to dry brush on some rust (not too red though) to highlight the rails and chairs. Te use of pale shades not only helps the sunny dusty effect often seen in summer, but also has the bonus of making a layout look bigger – and that is never a bad thing. 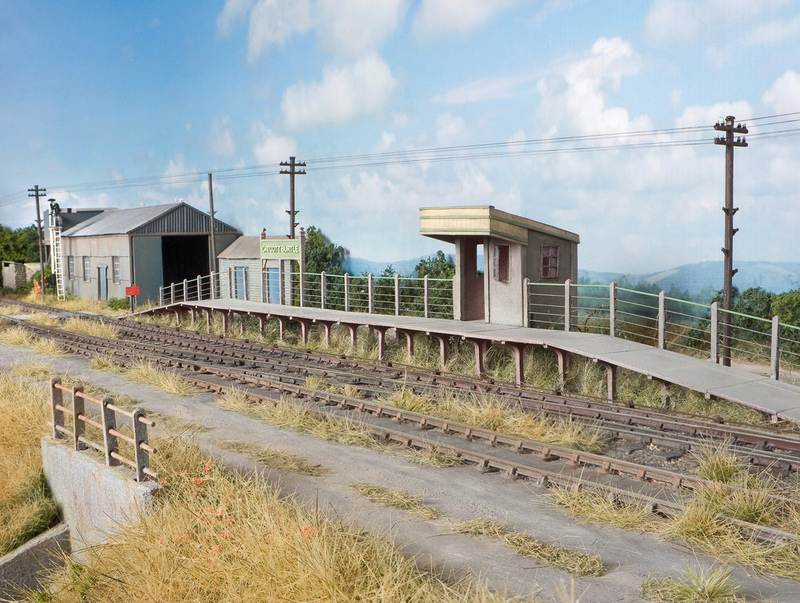 This feature is from article I previously had published in Model Rail - the leading magazine to show you 'how'. An excellent post Chris and a nicely timed reminder of your methods. I have been meaning to try this idea of yours since I first read of it on your blog posts. Another brilliant post on doing it better and cheaper. Really helpful this article Chris, its the second time I've read it and Im now going to give it a go on the new N gauge layout. Sorry to be dense but what is the point of painting sleepers initially if they are covered in clay which is then painted. I am struggling to understand this but want to as this is just the effect I am looking for! Is the idea to keep the clay off the sleepers? Sorry to be dense...this is just the effect I am looking for but I am not quite clear on how to achieve. I paint the sleepers initially....get that....but then I cover them in clay that needs painting?......or does the clay just sit between sleepers and then each gap gets painted individually? What issue of model rail did this article come from Chris? Possibly Dec 2009. This blog version is more up to date. Das is ok, I’ve not noticed and shrinking. The Air Clay does though. Das would be my choice if you can choose.